Back when Congressman Joe Wilson shouted, "You lie," at President Obama, Karl Rove thought it was hilarious, and lauded Wilson as a "good guy." Ignoring the blatant racism and nearly all-white crowds, Rove referred to the tea partiers as "a wide and diverse group," and has supported the Tea Party Movement. Plus, as most of us know, Rove has long been a proponent of doing whatever it takes to achieve an agenda. 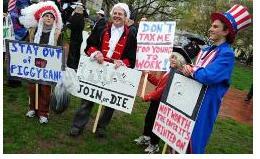 As reported by the Washington Examiner, the Rove-supported town hall protests were ". . . the return of the Karl Rove playbook: The effort to mobilize the angriest fringe of the Republican base was guided by a conservative dream team that included the same GOP henchmen who Swift-boated John Kerry in 2004, smeared John McCain in 2000, wrote the script for Republican obstructionism on global warming, and harpooned the health care reform effort led by Hillary Clinton in 1993." So given all of this, one would think that Karl Rove is a big believer in people using whatever tactic they think will get the job done, right? Think again -- especially when the target of the protest is Karl Rove himself, and the protester is a Code Pink activist interrupting his book signing. With video. Rove took umbrage with the hosts of Fox & Friends this weekend for asking him about the Code Pink protester who showed up at his recent book signing. In the past, Rove has acted strangely intimidated -- maybe even frightened -- of the Code Pink protesters. But this weekend, when asked about the disruption, Rove indignantly sounded off to the giggling Fox & Friends hosts, saying, "This is sad. You people are recycling stuff that happened three or four weeks ago. Please. This is a small blemish on what was otherwise a great trip . . . sort of sad and pathetic people . . . can you imagine being some kind of nut wandering around with handcuffs thinking you've got the right to arrest anybody you want?" Hmmm . . . no more so than wandering around dressed like this.